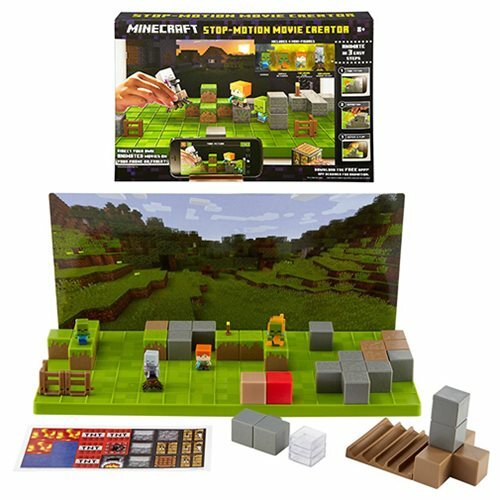 Create your own Minecraft movie with this Minecraft Motion Movie Creator Playset! Become the director by grabbing your phone or tablet and create fun and exciting adventures using the included props and four min-figures. Download the free mobile app to animate your scene in three simple steps. Swap out the background cards, props, and environment pieces for endless storytelling. This playset includes four different backgrounds, two exclusive mini-figures, the Spider Jockey and Alex with a diamond pickaxe, two additional mini-figures, zombie and zombie in flames, props and a phone/tablet holder. Ages 8 and up.